Drifting is a sport that encapsulates the entire excitement of automobiles into 30-second runs of fierce side-by-side competition. Similar to any other professional sport, the competitors are starting younger. We caught up with 19-year-old professional sideways specialist Alec Hohnadell, after finishing his second year in Formula Drift Pro 1, to discuss his journey up to this point. Long Beach, Calif. – July 25, 2015 – Formula DRIFT presented by GoPro returned to Evergreen Speedway for Round 5: Throwdown. Fredric Aasbo in the Rockstar Energy Drink / Hankook Scion tC takes the victory and lead in both the Pro Championship and World Championship standings. Round 5: Throwdown provided plenty of on-track action and excitement for the capacity crowd at Evergreen Speedway. With shifting weather conditions, the drivers had to make constant adjustments throughout the weekend making for a technical competition. Over 330,000 fans tuned into the Driftstream over the weekend to see the action unfold. The semi-finals saw Alec Hohnadell in the 11 Racing Nissan S14 go against veteran Justin Pawlak in the Roush Performance / Car Crafters Ford Mustang. Hohnadell advanced to the Finals with both drivers receiving a double zero on the second run of their battle and having the advantage on the first run. Pat Goodin in the Enjuku Racing / Falken Tire Nissan S13 lost out to the consistent driving of Fredric Aasbo. Pawlak finished in third place with the higher qualifying position than Goodin. The rain began to pour into the Finals and Aasbo proved that he can handle the wet conditions taking his second consecutive victory and his third victory of the season. Aasbo moves into the top position in both the Pro Championship and World Championship standings. 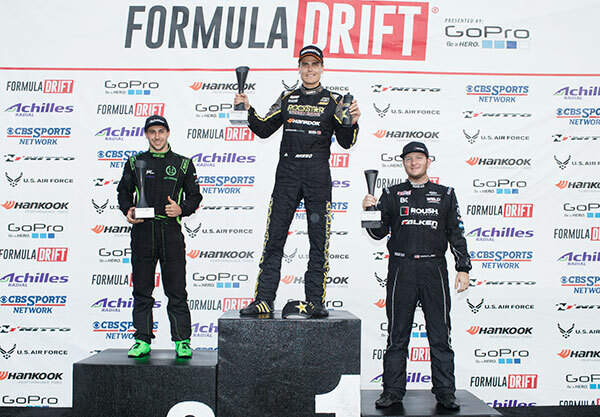 Hohnadell earned second place for his first career Pro Championship podium. The 2015 Formula DRIFT season will continue to Round 6: Showdown on August 21-22 at Texas Motor Speedway. For more information visit: www.formuladrift.com and find Formula DRIFT on Instagram, Facebook and Twitter. Tune into Formula DRIFT on CBS Sports and check your local listings for airtimes.